Gordon, Journal of the Horticultural Society of London, 1849, 4, New Plants, etc., from the Society's Garden, p. 296-297. 31. CUPRESSUS MACROCARPA : Hartweg, in Journal of Hort. Soc., vol. ii. p. 187. C. Lambertiana of the gardens. Found in California by Mr. Hartweg. Leaves ovate, imbricated, in four rows, bright grass green and closely set upon the old plants; they are expanded, awl-shaped, sharp pointed, and thickly set, upon the young plants. Branches irregularly spiral, but sometimes alternate or opposite, younger ones and laterals opposite, dense, and quite green, older branches dark brown and nearly horizontal from the main stem. Cones in clusters of three or four together, oblong 1½ inch long and 1 inch broad, with ten scales, the larger of which are in the middle and generally six sided. Seeds large dark brown, and more or less angular. Seed-leaves in fours; but sometimes only in threes. In the year 1838 the late Mr. Lambert gave the Society a few seeds of this Cypress without any name or indication of whence he had obtained the seeds; from these plants were raised, which, when large enough, were at once seen to be very distinct from any previously known. The name of C. Lambertiana was applied to them, both in compliment to Mr. Lambert, and also to mark from whence they were first obtained ; and as the plant was very easily increased by cuttings, it was soon to be found in all good collections under that name. Nothing, however, was ascertained concerning the country from whence it came until some two or three years afterwards, when I observed, on visiting Mr. Low's nursery, at Clapton, a plant of the same kind which they had received from Dr. Fischer, of St. Petersburg, as a new species of Cupressus from California. 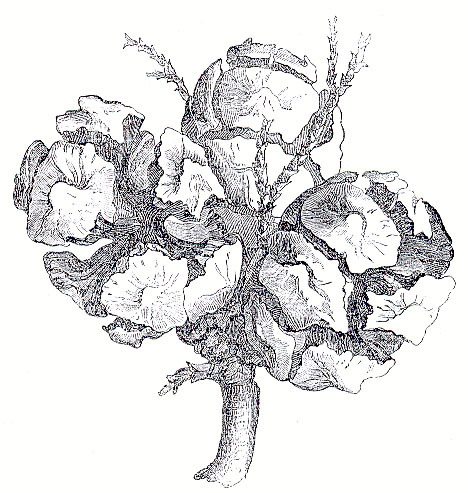 At a later period, Mr. Hartweg, when in Upper California, discovered it, and finding it had very large fruit, gave it the name of C. macrocarpa, which, having been published in the Society's Journal, takes precedence of the unpublished though general name of C. Lambertiana. It is one of the finest plants yet introduced as an evergreen tree, not only on account of its beautiful bright green aspect, but for its great size and hardiness. Mr. Hartweg found it forming a tree 60 feet high, with a stem 9 feet in circumference, on the wooded heights near Monterey in Upper California, and with far-spreading branches flat at top, like a full-grown Cedar of Lebanon, which it very much resembles when old. It is perfectly hardy, and will grow in almost any kind of soil which is not very poor.